NewsHammer Exclusive No question the Large Hadron Collider scored a brilliant success with its first collisions at 7 TeV. Considering the extreme complexity of the detectors/ reactors this was a breathless performance. Soon after the 1 PM Geneva start, all four massive experiments were delivering data during the 3 hour window. 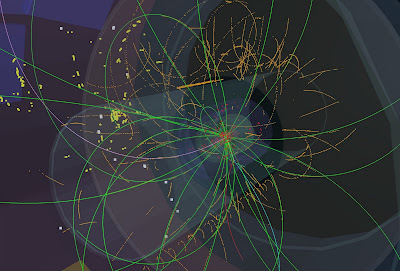 The first particle tracks and jets that were recorded surprised and delighted the physicists at CERN. At 7 TeV something new was going on that hadn't been seen before at any other collider, the signals of a New Physics. 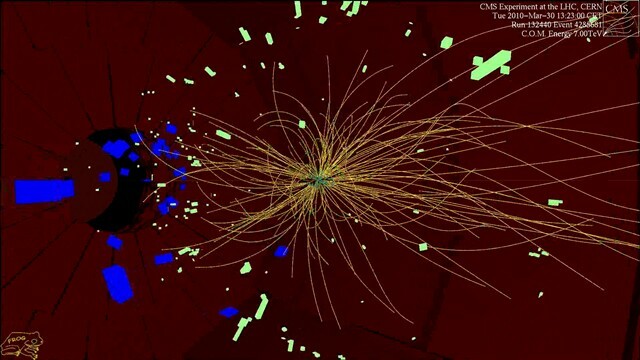 Though if you managed to sit through CERN's live webcast all day March 30, (video highlights: LHC First Physics) at least an interminable 27 km long, you still wouldn't have found out what that New Physics was or what CERN physicists were thinking. 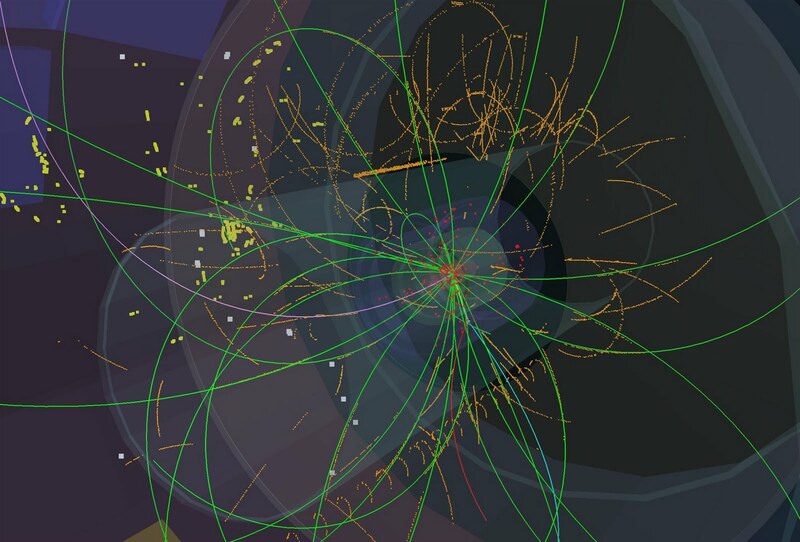 The only relevant comment I heard was that some muons were produced, and as they are decay products from heavier particles, some massive particles should have been produced, what CERN hopes for including the massive Higgs. With everyone so dazed and happy for the collider, by the time the CERN Press Conference started even the mostly 20-something journalists forgot to ask any new or relevant questions. It was one of those great cathartic moments where you're thrilled to have survived the biggest physics experiment ever when it's a hundred meters under your feet. Confusing anyway to get focused on results with a loud echo for the first half-hour and more loud simultaneous French translation overlapping. Good thing CERN A/V wasn't running any important experiments. On camera four spokespersons and "two people waiting in Japan" weren't deterred. Another spokesperson for CERN PR coordinating the spokespersons and reporters while walking around the wireless mic kept tripping over the "two people" on the live video feed. "Two people waiting in Japan" who maybe had a comment? What were "two people" doing in Japan? What "two people"? The not just any "two people" turned out to be Sergio Bertolucci, CERN's Director of Research and Director General Rolf-Dieter Heuer, but anyway they were happy enough splitting a bottle of 1991 red collider wine, the year CERN started thinking about the LHC. "The most exciting thing is we are just mapping the unknown. And so the most striking things will be the unexpected things we might find there." Though we've heard variations on this theme from just about everyone. For the "unexpected things" well they're unexpected but at least we should be told just how much time we have before they arrive. CERN knows more or less but CERN won't say in so many words. Not even what the March 30 departure point was or where's the blasted finish line. Is today a sprint or the stage one of the marathon? What stages exactly? 7 TeV doesn't really cover it but it sounds great, another collider record. Get the camera Fabiola! Listening very closely that day some of us were sort of warned. 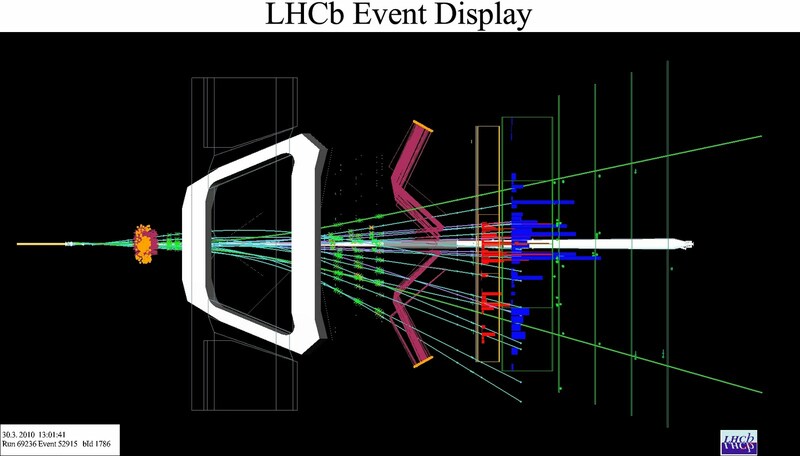 Piecing it together from the friendly banter the LHC was still taking its first "baby" steps. Mama and Papa CERN were very proud. If there was a buzz word through that exhausting day, it was "baby" and double that for "new babies" from our excited Italian hostess, who was doing nearly all the talking for everybody in her webcast from control room to control room while two guys were chatting in a loud French voiceover, like at the back of a church. They had some interesting things to say if you could hear them. Thanks CERN A/V, a division of CERN PR, leaving us hankering for Tom Hanks in the final analysis. Instead of a nice clean start, say 2 minutes of CERN's objectives for the day or a Press Release on that: how many bunches of protons, how many protons per bunch for this first 7 TeV experiment -- a lot of happy and excited people at CERN were telling us over and over again how happy they were for and hours and hours. Sure we're glad they're all happy. But being so very happy about all the ''new babies" the collider was having, our hostess and her physicists forgot what millions of people out there wanted to know. Was she going to bring them coffee? Even 40 Live Status LHC Pages were no help with how many bunches were loaded into the collider that day: The CERN variation on Russian Roulette. Bits of what we needed to know did come out in gurgles. 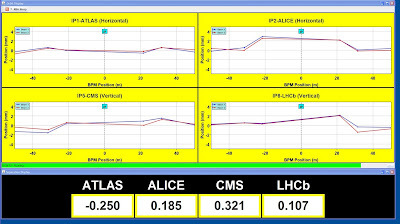 ATLAS was having fewer "babies", only about 30 per second, while CMS was having 100 "babies" per second, and LHCb went from 50 to 60 "new babies", but we never did find out if ALICE got knocked-up down the rabbit hole until we saw the "baby" scan and hers were certainly hairier than any other "new babies", so Wow. The "babies" were collision events of course, 2 protons making one collision "baby", but the mother of all colliders obviously wasn't making "babies" the way she should. Where were all the other "babies"? Once upon a time CERN was forecasting 1 million collisions per second per experiment. Later on at the mighty ATLAS we got the new ultimate forecast: 40 million "babies" per second in each detector or times 4 making 160 million per second overall. Evidently for now something was wrong. Not enough squeezing going on, or a low proton count. Both as it turned out, but you had to beam down via the Internet and watch the naked collider in action. The first clue was March 29, NewsHammer "CERN Fires The Collider" when only 2 bunches per beam made it into the collider round. Then bright and early March 30 there were 2 aborted ramps to get stable beams and with millions of people getting bored CERN tried square one. With the "baby" machine feeling testy, the absolute minimum 1 bunch per beam was knocked in instead of 2 or the nominal 2808 bunches per beam we were told to expect for years and years. Then how many protons? The maximum per bunch is 100 billion according to CERN. Nobody said how many protons before, during or since March 30, but one of the two French guys in the background voiceover did mention "5 milliards de protons" or 5 billion, or 1/20 the nominal number of protons per bunch. So at most there were 10 billion protons that could have collided, or in overall terms the very rock bottom minimum or the lowest possible luminosity next to zero. The maximum intensity would have been 2 x 2808 x 100 billion for a very large number of protons circulating eventually or 561,600 billion. Versus 10 billion protons March 30, meaning the LHC achieved 1/56,160 of its potential in protons. Far less than that when it comes to LHC luminosity or the ultimate shootout at CERN's OK Corral. During the webcast we did catch 2 other related facts. At 10 billion protons in the collider, maximum collisions in any one detector would be 11,000 per second where at CMS with the most "babies" there were 100 per second. ATLAS was aiming for 40 million collisions per second in any detector, but not today. CMS with the best score achieved 100/40,000,000 or 1/400,000 of what it can do at 7 TeV. Or at the per second OK Corral Rehearsal 200 bullets smashed into each other vs 80 million that will smash one of these days. If all goes well late next year we might see maximum luminosity at 7 TeV or 400,000 times more collisions per second. In 2013 the ultimate proton fireball at 14 TeV will be over (no typo) 100 billion times the core temperature of our sun or ~ 10^16 °C. Step 4: "Don't panic." Good advice from an LHC operating manual. Hot enough for ya? will be something to brag about if there's anyone left at CERN. So the big event March 30 was a very small physics experiment, though with some risk to the LHC machine. Because of the way CERN handled it and the media reported it, there's a general sigh of relief. 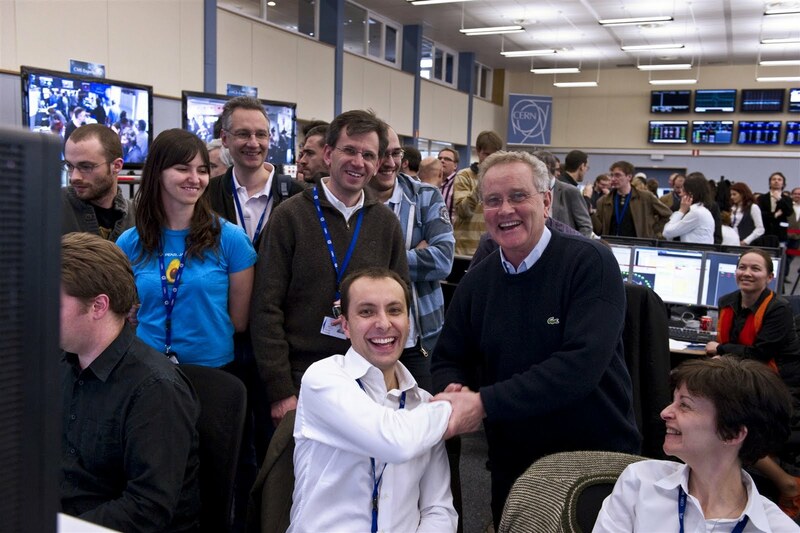 We're still here, the LHC is safe. Nothing more to worry about after the Barnum and Bailey Collider Test. Nothing wrong with going for the smallest possible test at 7 TeV. The smart and prudent way to go, except when you don't disclose the facts clearly and let people imagine they're getting the full Big Bang for their buck. Echoes of "There's one born every minute." Belatedly offering soundbites to the media on increasing collisions to 300 per second and a stab at luminosity, again after the brouhaha of March 30, is more you-knew-all-along sleight of hand through the back door for millions of empty chairs who won't complain. Making lame excuses before the collisions like the LHC would be colliding beams together over the Atlantic, in case of PR failure, was rather embarrassing, though a genuine attempt at some false modesty. Canceling the Tom Hanks Show at the collider was the biggest CERN event. It finally dawned on CERN that the most important physics experiment since Trinity should be treated seriously. 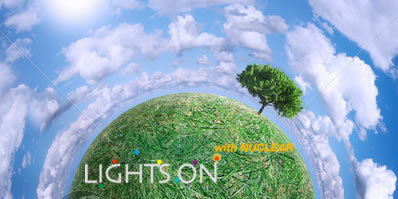 The live interactive video/data player for the webcast was first rate and another positive step. But being hustled into CERN's Big Top for a handful of firecrackers like this is it, The Greatest Show on Earth, is another sad comment on how easy it is to fool people. You can make allowances for any live event, that the excitement overtakes the action and the facts. But CERN has had years to get the facts across and a week since March 30 for revisiting unfortunate false impressions. The postmortem CERN Press Release "Yes we did it" makes no corrections. 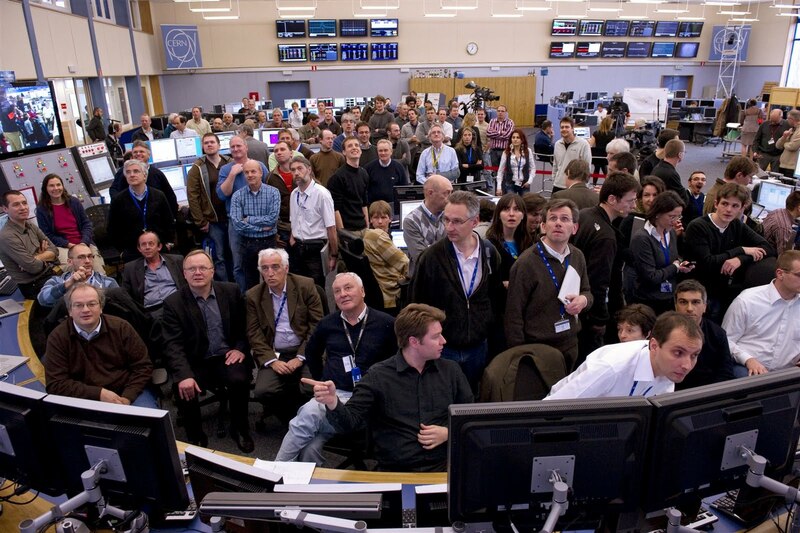 Of course there are no bragging rights if CERN simply stated in advance and during the March 30 demonstration that the 7 TeV test collisions were slated for about 1/400,000 of design efficiency. Then of course nothing of LHC safety would be proved either, except that the LHC is apparently safe to operate at an extremely tiny fraction of its potential. Now that the public is satisfied with safety CERN can go to the LHC maximum. Not right away, as the machine is unreliable. Failures since start-up including this week are common. Luminosity consequently has to be coaxed up in stages or there will be no more "babies"and no more collider. Go slow is commendable to save the collider from another accident. But why not tell us? It was no secret inside CERN, just outside. The biggest safety issue has always been the LHC's New Physics. 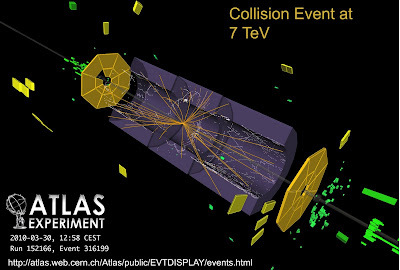 Now apparent safety (of small numbers) of 7 TeV collisions will be taken as a proof of safety for what is to come. Actual physics results even from March 30 may never be fully known. 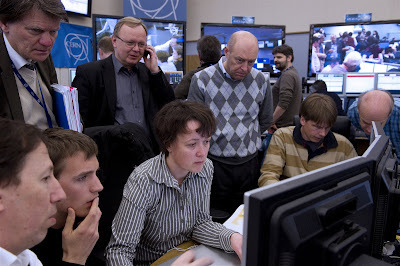 Dangerous sorts of Collider Objects might have been produced and might have gone undetected during the 3 hour run of March 30 of about 1/2 million proton collisions recorded. What will happen in 2011 in a proton fireball of 40 million collisions per second? When the truth is known, you can fly. CERN had already predetermined that First Physics at 7 TeV would be 1 proton bunch per beam, 1 x 1 for the first three days of collisions, then a week of tests on multi-bunches, then a jump to 4 x 4 or 4 bunches per beam colliding for another 2 days. Then a bigger jump to 12 x 12 collisions for 2 more days. Then who knows? Though CERN hasn't been able to achieve these results due to ongoing machine failures. 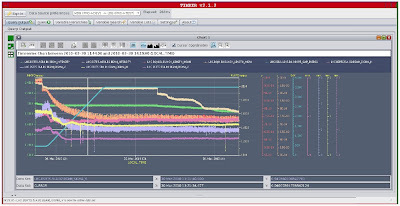 Down the road: "BEAM PARAMETERS AND MACHINE PERFORMANCE TO BE REACHED IN 2010"*. What we can expect now is less machine risk as proton bunches are gradually maximized in stages. It will take until the end of this year to reach about 800 bunches per beam out of 2808, another lucky fact blown out of CERN's windy webcast. Luminosity will still continue climbing next year to the maximum. The obscure but essential CERN document (above) "Pilot physics run at 3.5 TeV"* should have been released to the public before March 30 or summed up in a CERN Press Release. Just a reminder to CERN that Press Releases are for the Press and provide the Press with tools, not more hot air to analyze. This short document would have made CERN's intentions clear on going slow (adding the rationale: the minimizing of machine failures and damage) and that would have pre-empted all the phony suspense of March 30. We could have got some more sleep instead. So we're not much further ahead in knowing what to expect from the LHC. The preliminary data and continuing collisions will give physicists some ideas, but data analysis isn't that easy. It could take months to see some New Physics papers on what happened. Even so physicists will be reluctant to draw conclusions from a few collision events, which is why they want to see 40 million per second. The funny thing is, because of the enormous amount of data these collisions produce, CERN's entire computing power can only record 2,000 events per second. So CERN will filter all data, discarding nearly all of it, hoping their filters will capture only the significant events, whatever they are. For now and since CERN decided to blast us with Collider PR 10 years ago, we're in another prolonged state of suspense. When is the axe going to fall? Certainly it looks like there is a better chance for safety in terms of shutting down before hazardous events arrive, if data analysis can determine the next threshold where New Physics might spin out of control. Though there are no guarantees that we'll have any bumpy warnings. Just ask ALICE when she's 10 feet tall. As to the future, the only real news out of the Press Conference was delivered by Steve Meyers, Director of Accelerators and Technology who talked about some long term goals and difficulties, announcing the next planned shutdown in Autumn 2011. After a year of upgrades to safety systems for another $235 Million (not mentioned) the LHC should be ready to start 14 TeV collisions in 2012, though giant bending magnets will still be difficult to retrain, some 1/3 of about 1,800 (not mentioned) needing 25 to 30 ramps and quenches. The much fabled LHC might have to settle for 13 TeV. *Note to CERN Techies: Put dates on all your documents. If Plan "A" is PR Mystification, your Plan "B" Common Timeline Confusion will mystify everyone else at CERN who needs to sift through a mountain of links to a mountain chain of documents that might save your life. This is Part 7 of a series on machine safety and potential risks of expected Collider Objects like mBH at the LHC when the collider jumps to very high energies starting March 30, 2010. "Doomsday Report: New Physics At The LHC" will appear in The Science of Conundrums. ... after bald spot confirmed during daring breast exam on a suspect unofficial FaceBook page to appease Gay Voters and Birthers. Dead Liberal Romney also officially confirmed dead after daring Time Machine raid by an HG Wells biographer who claims Obamacare was hijacked from Mitt since HG stole everything including his An Outline of History from a Canadian Spinster or maybe from history when he travelled into the future and incidently inspired Mitt later as HG fell for Yvettte Mimieux in the much better 1960 movie version with Rod Taylor on Blu-ray he found in a dustbin in Clapham in 2025, compelling HG to write The Time Machine when he got back to 1895. Or for the facts wait at least a 100 years to read today's Breaking News, and you might get lucky. Throwup bag is optional on this Google vertigo vision of the future. Steve Jobs must be turning green according to iApple insiders who say that a mysterious iPhone is still texting from an undisclosed underground location: "I'll get you Google! And your Android too." It's about Chancellor Angela Merkel, also a Nuclear Physicist, backsliding on decommissioning all German nuclear reactors. Now some older reactors have been shut down pending safety reviews. Old nuclear reactors and containment systems are radioactive waste, plus there are already many unsecured dumps of secondary nuclear waste from these plants as a byproduct of operations and maintenance, plus the many thousands of tons of spent fuel rods considered primary nuclear waste still stored at reactors. Hmmm? Might consider splitting off new Radiation Sports from the Ministry for a better spin on PR. Atomic Baseball In Japan: Fun For Whole Family! Inside Daiichi: "A Catastrophe In The Making"
The clip starts with Robert Dudley, soon to be BP's new Mr Clean. "The science of plumes hanging in the water doesn't feel right". Yeah if you're on the same blank page as Tony Hayward. Dr Samantha Joye of UGA Marine Sciences talks to Rachel Maddow of MSNBC (above). Not only is dispersed oil in the Gulf a threat to marine life, methane gas from the BP Spill is another major hazard, both also acting as oxygen depleters. Subsea Dead Zones could be as bad as oil washing ashore. In an interview with The Atlanta Journal-Constitution June 8, she said that "...researchers were frustrated that so far the company [BP] has not revealed the chemical makeup of dispersants it is putting in the oil to keep it from washing ashore. The next day Dr Joye delivered a report on the Undersea Spill to the House Subcommittee on Energy And Environment. She sounded this alarm: "...oil on the surface of the ocean and even on beaches can be cleaned up. Dispersed oil cannot be cleaned up, rather it moves with the water and the oil and dispersants are likely to influence oceanic ecosystems for years to come...."
Follow Dr Joye's weekly podcast on the BP Spill from The University of Georgia. For her own personal journey through the Gulf Crisis as a scientist investigating the damage, see her Gulf Oil Blog. If you've got questions, she's got answers. With all the media wailing and all the stonewalling and BS from BP, here's a source you can trust. Hey EPA: How Are Those Dispersant Tests Going? Nearly 5,000 miles from the oil-spill catastrophe in the Gulf of Mexico, BP and its culture of cost-cutting are contributing to another environmental mess in the Prudhoe Bay oil field on Alaska’s north shore, according to internal BP documents and more than a dozen employees interviewed over the past month. . . .
Two BP management officials, who requested anonymity because they were not authorized to discuss internal matters, said budget cuts were largely the reason equipment was not upgraded or repaired, and indicated that much of it has yet to be addressed. BP's Alaska budget for 2010 is $1 billion, compared with $1.1 billion in 2009 and $1.3 billion in 2008. 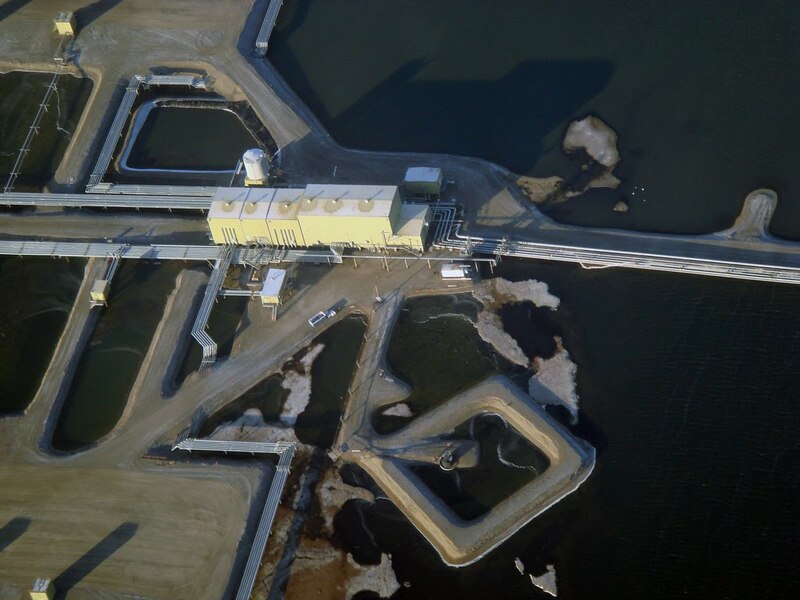 Moreover, according to two BP Alaska officials, projects related to "safety and integrity" have been cut by 30 percent this year and BP’s senior managers receive bonuses for not using funds from BP’s designated maintenance budget, a company wide policy implemented by Hayward. Documents show that Hayward also implemented a cost-cutting directive following the oil spills in 2006 in Prudhoe Bay. . . .
Read Jason Leopold's full report in truthout. Read the story of BP Alaska's Run To Failure in "Years of Internal BP Probes Warned That Neglect Could Lead to Accidents" on ProPublica. More on the BP Alaska Spill of 2006 "Fmr. EPA Investigator Scott West: US Has Told BP "It Can Do Whatever It Wants and Won’t Be Held Accountable"" on Democracy Now! "We have focused like a laser on safe and reliable operations. We have made major changes." "If there's any evidence that anybody put costs above safety I will take action. Sorry, Tony meant covert action.
. . . Nowhere was the absurdity of the policy [deep-sea drillers exempt from environmental review] more evident than in the application that BP submitted for its Deepwater Horizon well only two months after Obama took office. BP claims that a spill is "unlikely" and states that it anticipates "no adverse impacts" to endangered wildlife or fisheries. Should a spill occur, it says, "no significant adverse impacts are expected" for the region's beaches, wetlands and coastal nesting birds. The company, noting that such elements are "not required" as part of the application, contains no scenario for a potential blowout, and no site-specific plan to respond to a spill. Instead, it cites an Oil Spill Response Plan that it had prepared for the entire Gulf region. Among the sensitive species BP anticipates protecting in the semitropical Gulf? "Walruses" and other cold-water mammals, including sea otters and sea lions. The mistake appears to be the result of a sloppy cut-and-paste job from BP's drilling plans for the Arctic. Even worse: Among the "primary equipment providers" for "rapid deployment of spill response resources," BP inexplicably provides the Web address of a Japanese home-shopping network. Such glaring errors expose the 582-page response "plan" as nothing more than a paperwork exercise. "It was clear that nobody read it," says Ruch, who represents government scientists. Continue reading Tim Dickinson's report on Rolling Stone . . .
Watch a short BP/Obama recap (above) followed by Tim Dickinson's Interview with Democracy Now!, transcript here. New World Order: "Dollar will get utterly destroyed"
2 Virginia Police Officers Are Fired Amid Allegations of Links to White Nationalists - The actions came after online reports by an anti-fascist organization prompted investigations. Your Friday Briefing - What to take away from the Mueller report. 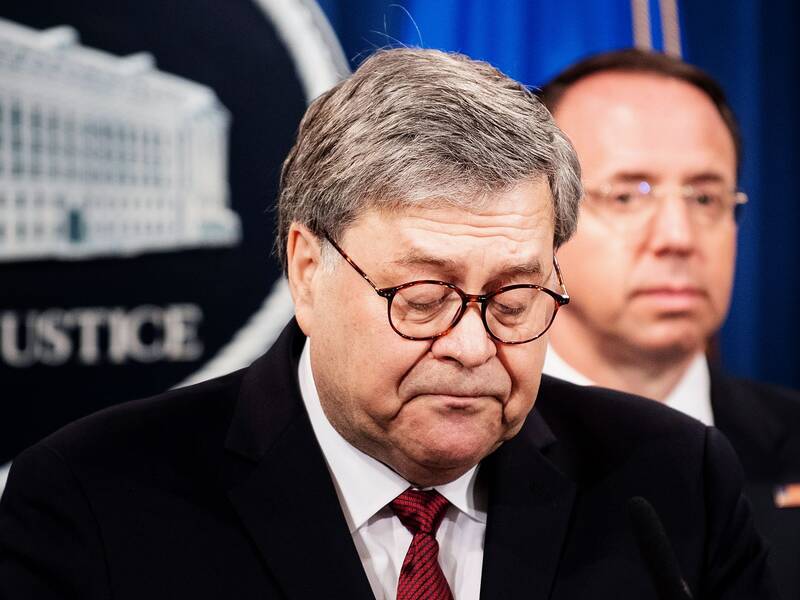 Is the Mueller Report Damning Enough to Be the Centerpiece of a 2020 Campaign? - How Bernie, Kamala, and the rest can approach this. Read the Mueller Report; Change Your Instagram Password - Catch up on the most important news today in 2 minutes or less. In new gaffe, Facebook improperly collects email contacts for 1.5 million - Remember when Facebook asked for email passwords? The blunder just got worse. H1N1 Mexican Swine Flu: A Two Stage Attack And The New Spanish Influenza? DEAL OR NO DEAL . . . Get me Conan! Obama shuts down CIA's network of secret prisons . . .
Electronic Medical Records: Will They Really Cut Costs? EuroBanks: Too Big To Save? Kenya: Going Nuclear w/ Iran? USA: Are We All Socialists? 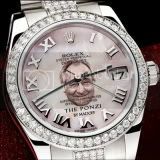 Get the Latest Front Pages from around the World widget and many other great free widgets at Widgetbox!